Insulating your floors and exterior walls can create big home energy savings, up to 20% or more in heating and cooling costs. It also increases the comfort and value of your home. Do you have cold floors or walls and high heating and cooling bills? If so, you could benefit from adding insulation to your exterior walls and floors (basement and crawl spaces). Insulation keeps your home warm in the winter and cool in the summer. Without floor or wall insulation, your home could be using over 20% more energy for extra heating and cooling—costing you lots of money! Adding insulation to these areas, whether doing it yourself or using a contractor, is one of the best ways to save energy and money and improve your home’s overall comfort. The cost will vary depending on the size of the project. Check the resources section for rebates available in your area for completing this upgrade. Insulation just makes sense. However, even in new construction, it is common for floors (basement or crawl space) not to have insulation. There are a few signs that you might need floor or wall insulation. Do any of these describe your home? If so, start by visually checking your current insulation levels to determine if you need to add floor or wall insulation. You can hire a professional to do an inspection or you can check yourself. If this is your first insulation project, consider also checking to see if attic insulation and weatherization are needed in your home. These can be lower cost projects with bigger benefits and may be a good place to start before you tackle the floor and wall insulation. Better yet, sign up for a Home Energy Checkup and get professional advice on which projects are cost-effective and recommended for your home. Do-It-Yourself Check. 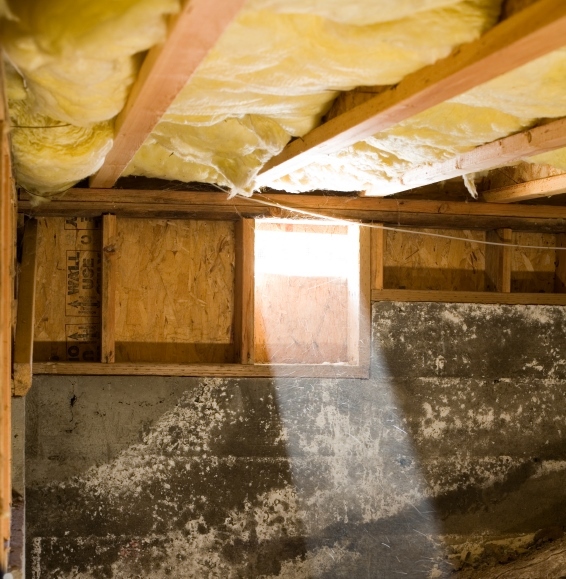 To check yourself, first determine if you already have insulation under your floors by looking in your basement or crawl space between the floor joists, sill plates, or along the foundation walls. To determine if your walls are insulated, there are a few methods you can use. Check behind wall outlets. If you feel comfortable, turn off the power to an electric outlet on an outside wall. Make sure to test the outlet is off (not working) before you remove it by plugging something into it. Then remove the switch plate and shine a flashlight into the opening to see if there is anything besides air between the studs. On a cold evening touch an exterior wall in a heated room to see if the surface is cold (this can also be done in the middle of a hot day to check for heat). You can also use an infrared thermometer to check the temperature of a wall and compare it to the ambient temperature within your home and the temperature outside. If your wall temperatures are much hotter or cooler than the temperature within your home, you may be dealing with no or poor insulation levels. To find out what level of insulation you need, check the Recommended Levels of Insulation guide from Energy Star. Safety precaution: If you see vermiculite, a lightweight, pea-sized flaky gray mineral insulating material, in your walls, don't disturb it as it may contain asbestos. Contact your local health department for instructions on safely testing whether the material is hazardous and have it removed by a certified asbestos abatement contractor. Professional Check. If you don’t have good access to under your house or you don’t feel confident checking for insulation yourself, contact a professional to inspect your home. Now that you have checked the status of your floors and walls, it's time to add insulation, as needed. This project can be done yourself, but you may want to hire a professional to do it. Below are some things to consider when deciding to DIY or hire a professional. Floor insulation. If your basement or crawl space is accessible and not too difficult to move around in, and you enjoy tackling bigger home improvement projects, basement sealing and insulation may be a good DIY project. Otherwise, consider hiring a contractor to do the job. Wall insulation. Adding insulation to walls can be a bigger job. If you are remodeling and will be opening exterior walls up (removing drywall), it is easy to add insulation. However, if you are not planning to open your walls up, the other option is blowing insulation into the wall spaces. This is more complicated and generally best left to the professionals. Costs. The upfront cost for insulating your floor or walls can range from a few hundred dollars for materials and supplies if you do it yourself to $1,000-2,000 or more for professional installation. Blowing insulation into existing walls can be expensive and may not be cost effective compared to the energy savings. Consider the costs, savings, and your budget before moving forward with any insulation project. If you decide to do this project yourself, check out the Energy Star guide to Basement and Crawlspace Air Sealing and Insulating. For your floor, be sure to also check for and seal air leaks. Be safe! Follow all the safety guidelines and recommendations. Otherwise, find and hire a professional to do the job for you. In many areas, there are experts that specialize in insulation installations.